GERALD “JERRY” DUANE STADSTAD was born on Sept.18,1944 in Vancouver, WA. His loving parents were Glenard and Margit Stadstad. It was then his life-long passion for motorcycles and cars began; beginning with hand made go carts. At 16 Jerry bought a 1949 Ford Crestline which in his words “it had been tinkered with to death.” In 1962 he drove his mom with all her plants from Vancouver to Boise. They arrived in a dust storm on a hot Sunday afternoon. It was here in Boise that his parents started Pay & Pack Electric and Plumbing. Jerry graduated from Borah High School that year. He then continued on to B.J.C. in Drafting & Design. In 1970 he graduated with a Bachelor of Architecture from ISU. That same year he met, fell in love with and married Mary Rose McClain. Their journey together lasted for 44 years. Jerry started his architectural apprenticeship with Cline Smull Hamil Shaw Architects. It was at that time he became interested in rental and commercial property, becoming the proud owner of several apartment buildings around Boise and Twin Falls. As a young couple they enjoyed creating bright clean affordable housing for many people over the next 40 years. They are so appreciative of all their tenants they have had over the years. Jerry also then worked for Edger Jensen Architects, Thurber Marler Architects, and Terry Butler Architects. As well as the City Housing Inspector and for Boise Cascade in their Housing Dept. Before retiring as an architect he worked with for Larry Knope and Lynn Brown doing drafting. His real passion was working side by side with Mary. Through his love for Motorcycles he joined the TVTMA Assoc. which provided him the opportunity to experience the back country in the West, Canada and Mexico. Many friendships began and his deep inner spiritual life was strengthened. 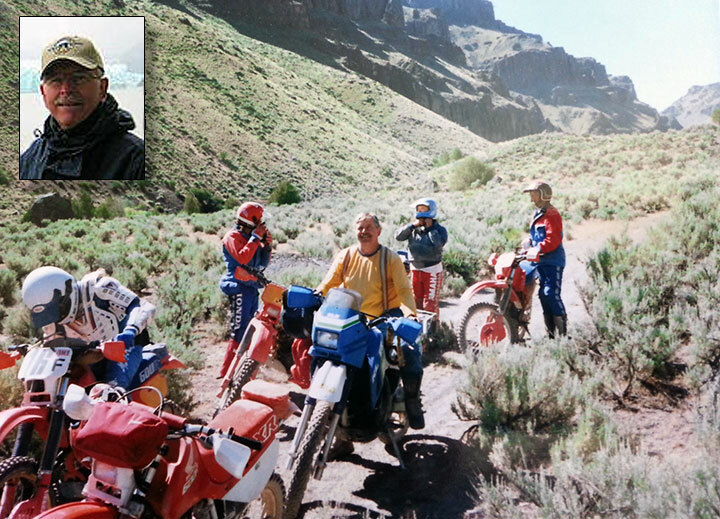 He enjoyed riding and spending time in Jarbidge, Nevada at their family cabin. Jerry not only left his loving wife Mary, but his daughters Robin Marie and Amy Ann Stadstad; as well as his dear sister, Janet Klingler and her husband Ron; special nephews, cousins and their wonderful families. Thanks to MSTI Cancer Care and their compassionate support he received while being treated for Melanoma. In lieu of flowers, you may make memorial contributions to the BlueRibbon Coalition (see button below) to preserve recreational access to trails on public lands. Jerry’s life touched many people and he will be deeply missed by his girls. Memories and condolences may be shared with the family on Jerry’s memorial webpage at www.summersfuneral.com.